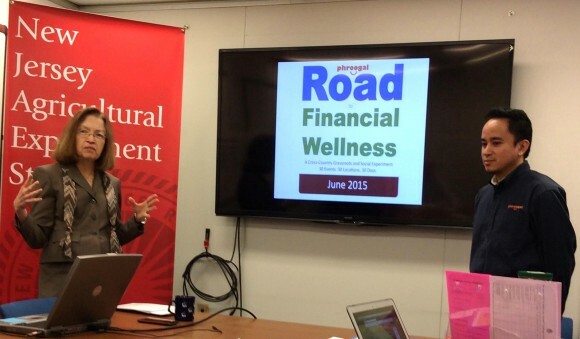 Share the post "Advice from the Road to Financial Wellness: Planning is a Key to Success"
Barbara O’Neill introduces Jason Vitug, founder of Phroogal. Along with three Phroogal staff members and a videographer, Vitug is traveling to 30 locations across the U.S. throughout the month of June 2015 to raise awareness of financial topics and encourage people to make better financial decisions. Vitug and his Phroogal team members were invited to make the pit stop at the university by Barbara O’Neill, Rutgers Cooperative Extension specialist in financial resource management. In addition to making motivational presentations, the Phroogal team is capturing stories of everyday people and sharing content across various social media channels including #TheRoad on Twitter. Participants at the “Road to Financial Wellness” seminar held at Rutgers on June 4. 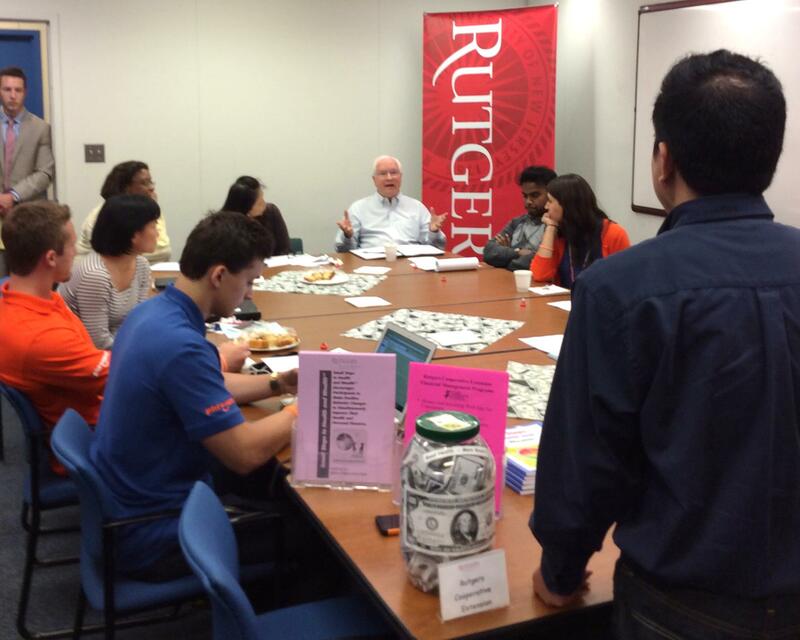 The Rutgers seminar focused on the importance of life planning and wise spending. Key points were “cutting expenses is more powerful than increasing income” and “a bargain is not a bargain unless you need it.” Vitug encouraged attendees to “envision the life you want to live,” and “have a life plan-not just a financial plan.” He also warned about the dangers of becoming over-extended on credit cards. Graduating from Rutgers University before the CARD Act took effect, Vitug charged $5,000 on a credit card that he applied for to get a frisbee. Vitug is not alone in recognizing the powerful impact of the planning process. Future-mindedness is a key personality trait that has been linked with successful financial outcomes. A 2015 study published in the Family and Consumer Sciences Research Journal found that a long planning horizon plays an important role in explaining household asset accumulation and financial security. The 2015 Savings Survey by the Consumer Federation of America found people with a “savings plan with specific goals” save more successfully than those without a plan. Planners are more careful spending money and more likely to make savings progress and have sufficient savings for emergencies and retirement. Planning begins with setting specific goals with a future date and dollar cost. Experts refer to these as SMART goals: Specific, Measurable, Attainable, Realistic, and Time-related. An example is “Save $6,000 to buy a car in three years.” Annual, monthly, and daily savings targets can then be set by “doing the math”: $2,000 per year, $167 per month and about $5.50 per day, in the above example. The Rutgers Cooperative Extension Financial Goal-Setting Worksheet is a useful tool for goal-related math calculations. L-R: Jason Vitug, Barbara O’Neill and Aidan Sander, staffer at NJ Coalition for Financial Education. Several recent studies have classified people according to their financial practices and identified attributes of financially successful people. Each has used a different term to describe a positive constellation of financial behaviors: Financial Well-Being (Consumer Financial Protection Bureau or CFPB), Financial Health (Center for Financial Services Innovation), and Financial Capability (FINRA Investor Education Foundation). All three entities, along with Phroogal, which uses the term Financial Wellness, refer to goal-setting and future planning in their descriptions of financially successful people. For example, people with financial well-being “are setting goals that are important to them and working toward those goals,” according to the CFPB, and “planning ahead for predictable life events” is a key component of financial capability according to FINRA. 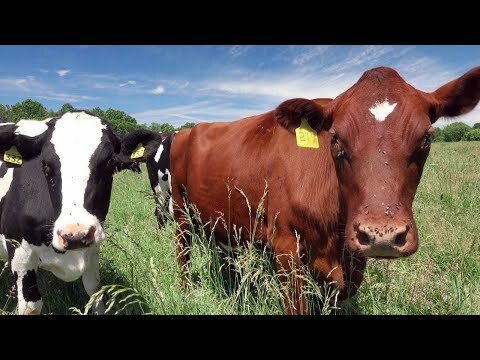 Want to be healthy and wealthy? Set specific goals, develop a realistic action plan, and work your plan. Every small step forward makes a big difference on the road to a better financial life.